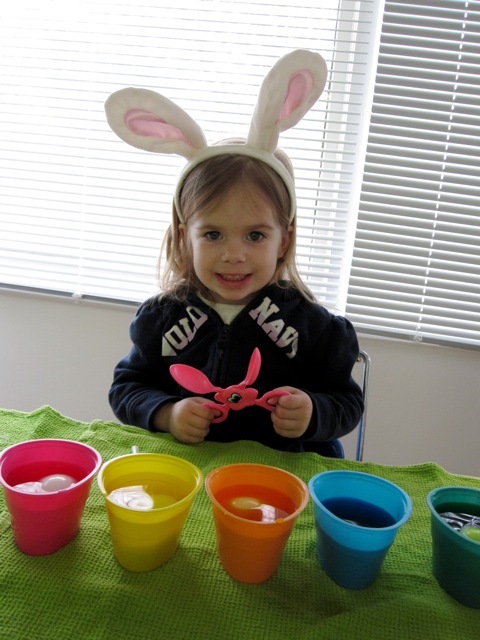 So it's Easter weekend, but eggs aren't the only thing we're dyeing at our house. (See where I'm going with this?) Ever since I started knitting, I've been dying (haha) to try something. I started by dividing my skein into ten small hanks. 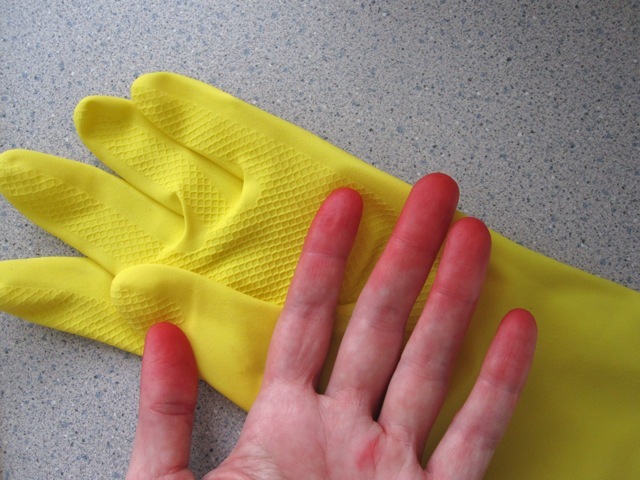 I wound them loosely so the dye would still absorb into the areas where I had twisted. 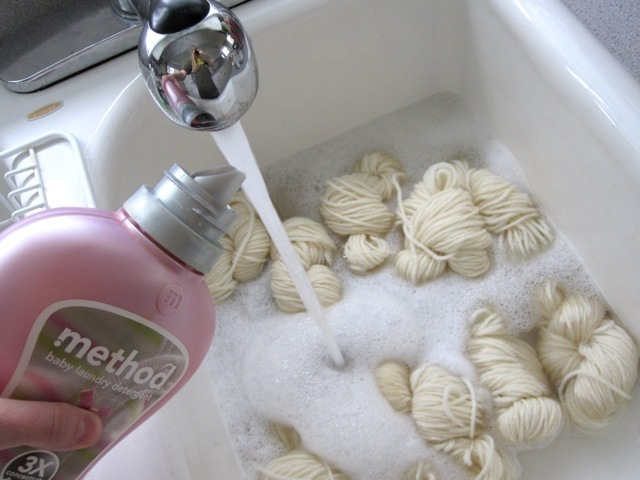 Then I gently washed the yarn in some mild soap in my kitchen sink. 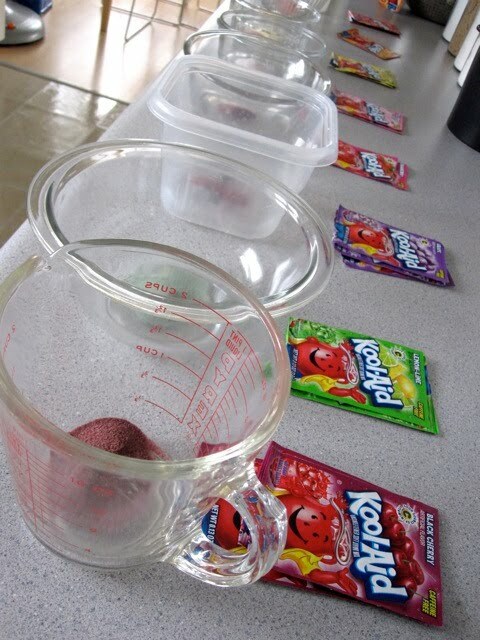 I lined up all of my small glass microwaveable bowls and dumped a package of Kool-Aid into each one – no need to add sugar. I poured a small amount of lukewarm water to each bowl and stirred until the powder was completely dissolved. This part made me awfully nostalgic, I have to admit. 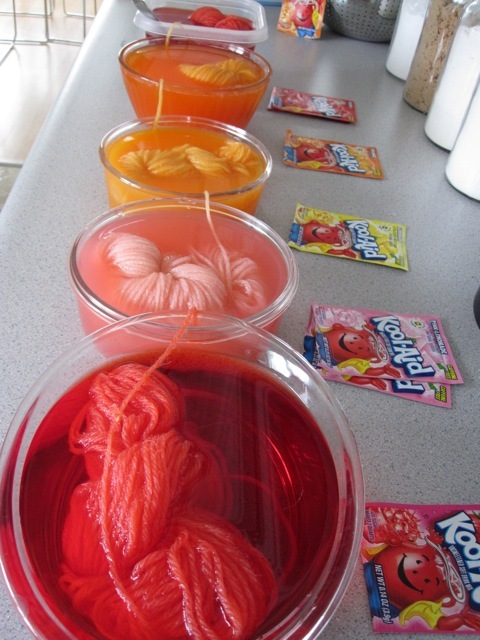 Kool-Aid smells awesome, and my whole kitchen was filled with the fruity scents! Plus it was just rad to see the bright colors. This would be a good time to grab some rubber gloves. Or your fingertips will be stained. For days. Like mine. 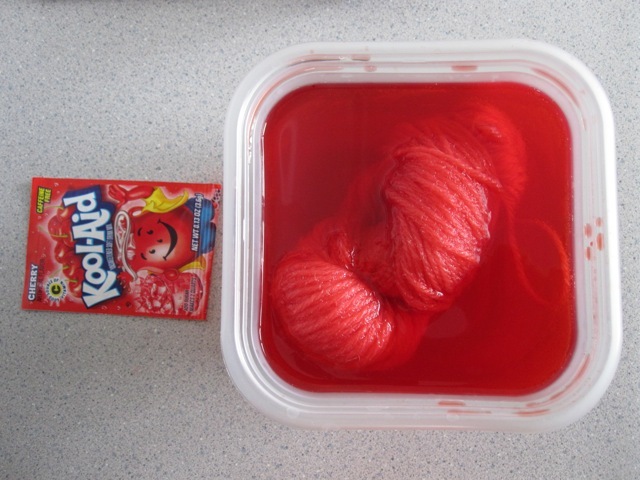 Next, I dunked each little hank/skein into a bowl of Kool-Aid, and added a little bit more water – enough to cover or almost cover the yarn. This part was quite exciting. 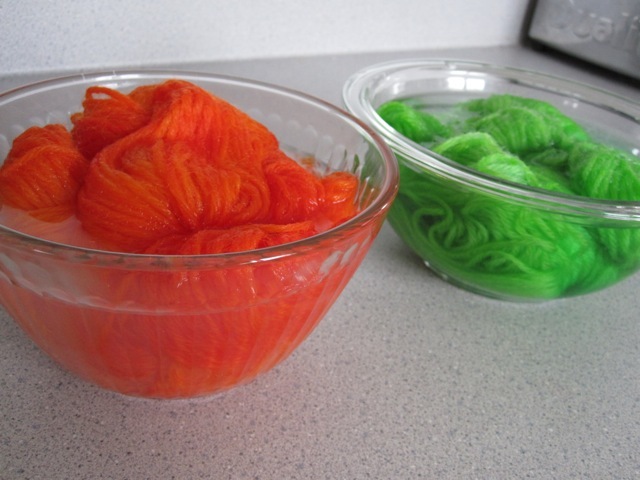 I put each bowl in the microwave for two minutes to set the dye (with the yarn still in it.) This is where things started to get messy. But I just kept an eye on my counter top and used an non-scratch abrasive cleaner to attack any big stains as soon as I could before moving on. After all of the bowls had been nuked, I let each one cool for a few minutes. 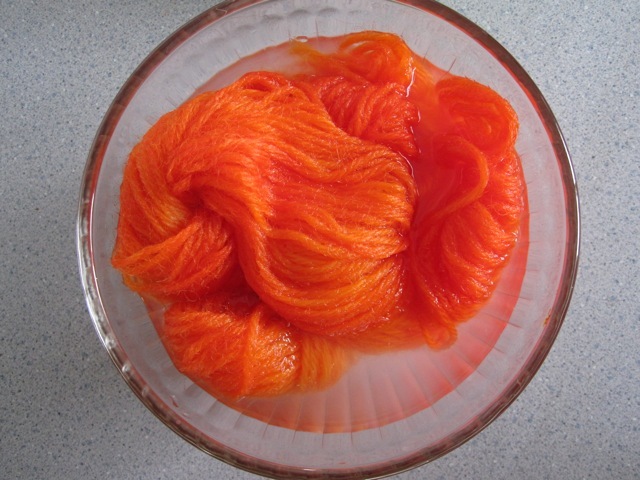 As it sits, the yarn will slowly absorb almost all of the color from the water around it. The water may look white-ish or a little bit cloudy, and some colors seemed to absorb better than others. I tried to get a photo of this but it's kind of hard to see. 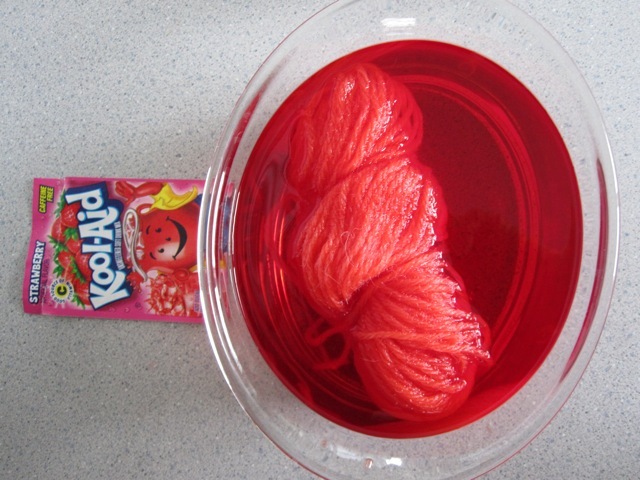 After the yarn had cooled and absorbed the Kool-Aid, I gently rinsed it with lukewarm water in the sink. 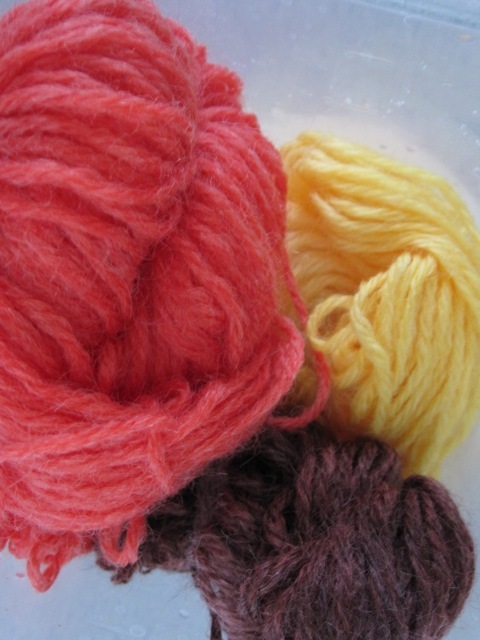 If the yarn is still warm, you need to use warm water to rinse it or you may cause it to felt a bit. I was nervous at first to put the different colors next to each other, but they didn't bleed. And that's it! I hung each color on a small drying rack to air out and dry, and then I plan to wind them up nicely (and probably join some ends together) to make some multicolored skeins of hand-dyed Kool-Aid yarn. 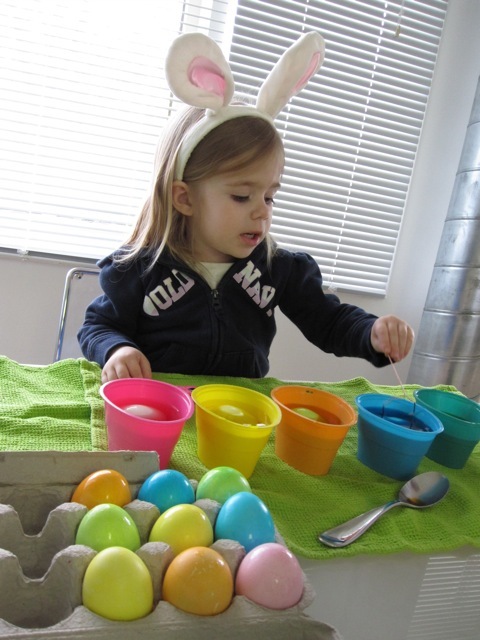 Of course, we did dye some eggs, too. The normal, traditional way, with a good old PAAS kit. I'm kind of particular about dyeing eggs. I just like them in plain, solid colors. I don't like to do anything weird to them. (Just ask Bo.) 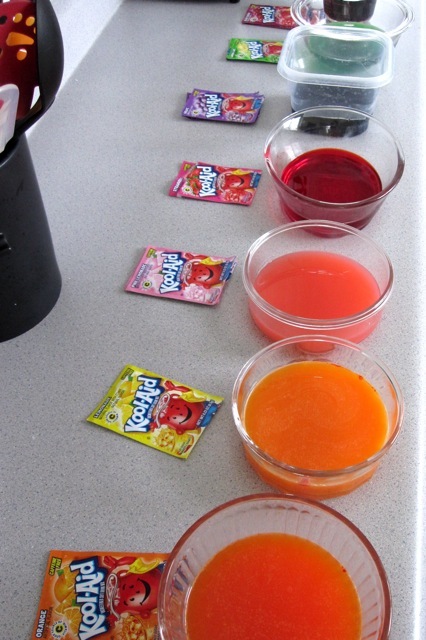 But next year ... we're totally using Kool-Aid to dye the eggs, too. Oh well. Wishing you a very lovely weekend and Happy Easter! 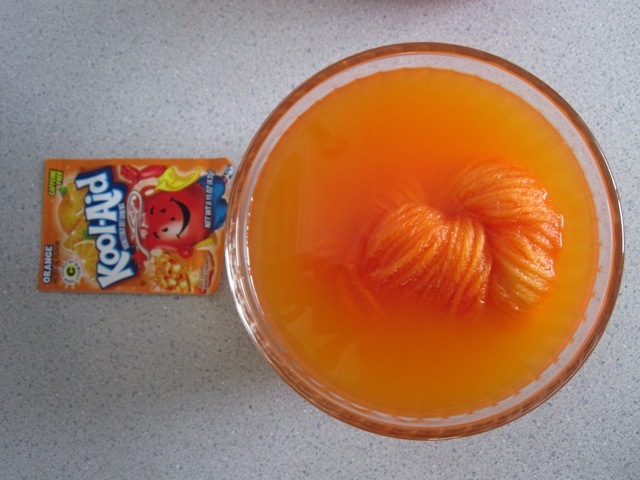 What a fantastic photo record of your Koolaid adventure! Thanks for such a treat! I'm so glad I stumbled onto your blog. What fun! 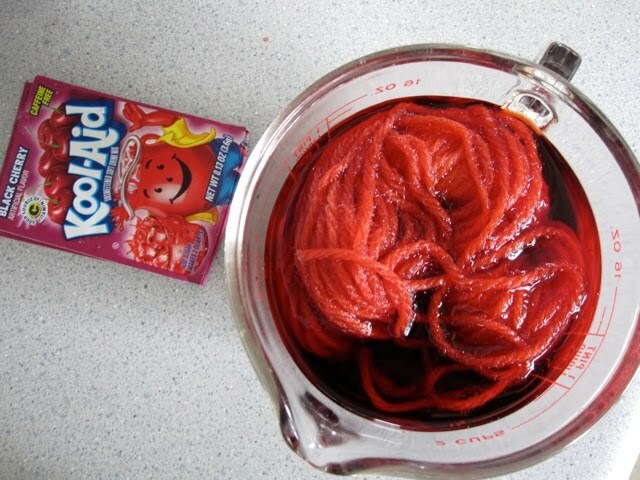 The smell of koolaid always brings me back as well....this is a must try! I have been wanting to try this out for some time! Now I really really have to! They turned out so pretty. And I actually am about to dye some eggs right now with my handy paas kit too! :) Happy Easter!! I don't knit or crochet, but I was captivated by your photos and dying experience! 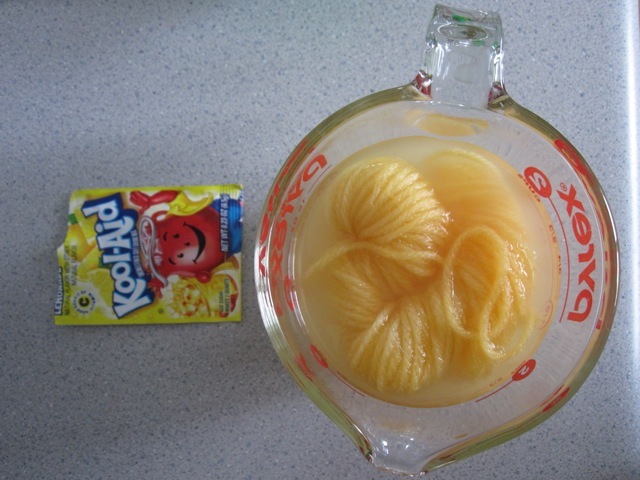 The last time I had Kool-Aid was ages ago, we buy the Crystal Light ones now! 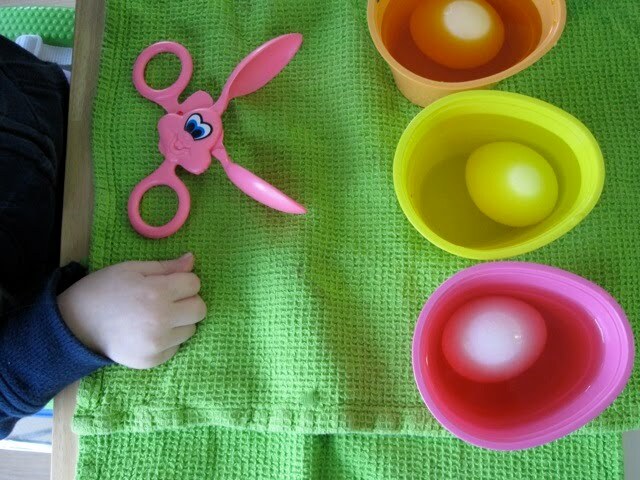 We dyed eggs today too, not so exciting and I stained my fingers! 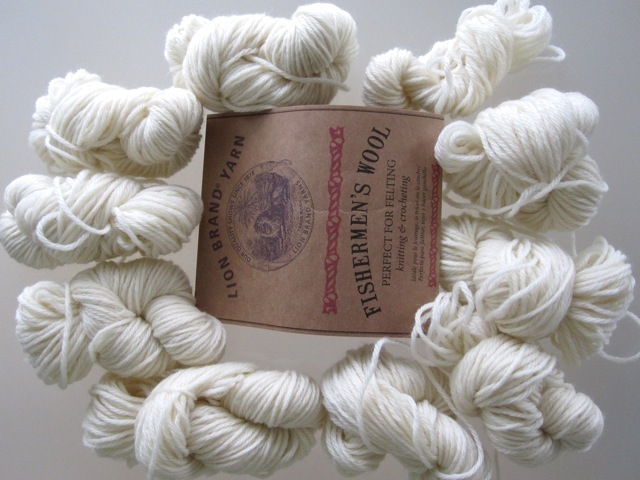 But I cannot wait to see what you make with those gorgeous hanks of yarn! I think I was on the look out for berry blue as well, but with no luck. Oh, I love dying stuff! 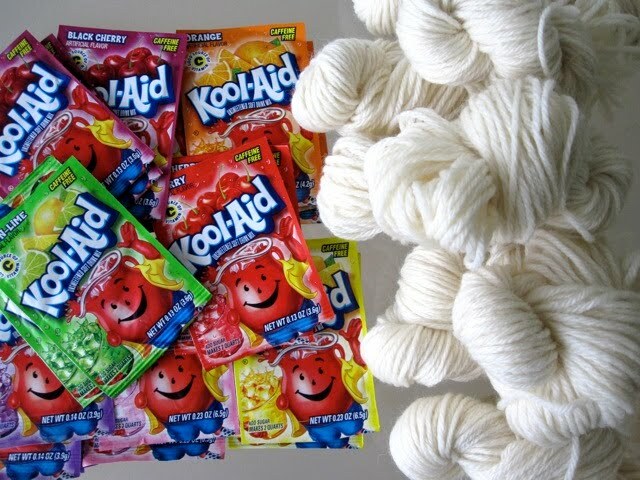 so wish I was there with you to hang out, knit, have a glass of kool-aid...Lo is too cute there!! totally cute! now i need koolaid! :) happy post-easter! Very Cool! I love pink lemonade Koolaid w/a little Malibu Rum mixed in! Very refreshing on a hot day! you are so clever with your yarn! i like to wash my scarves though, so i'm wondering if the color will run? hope you had a lovely weekend! Awesome pictures of the process. 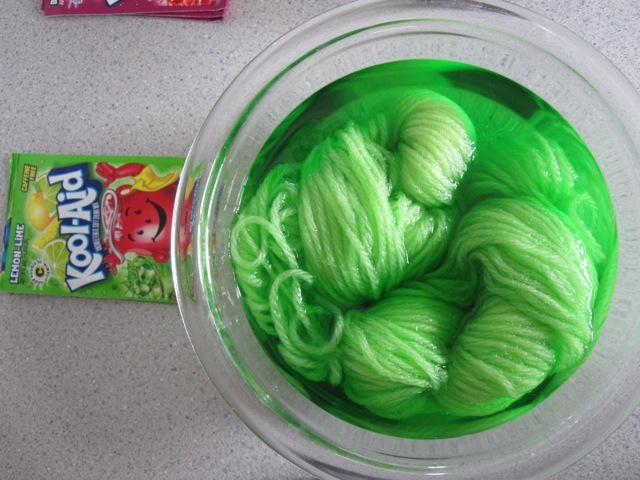 I love dyeing with Kool-aid. If you add a splash of white vinegar to each bowl with the water, it will help the color to set and make it less likely to fade when you wash it. 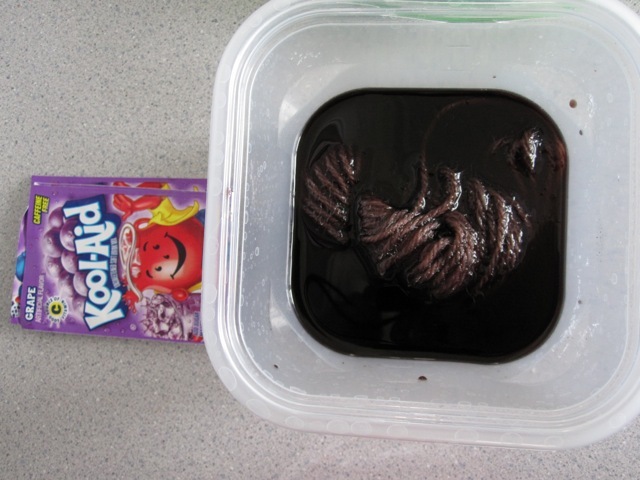 I absolutely love your diary of koolaid dying. What a superb job you did with narrating and photos. I am motivated to try this! Thanks for sharing! 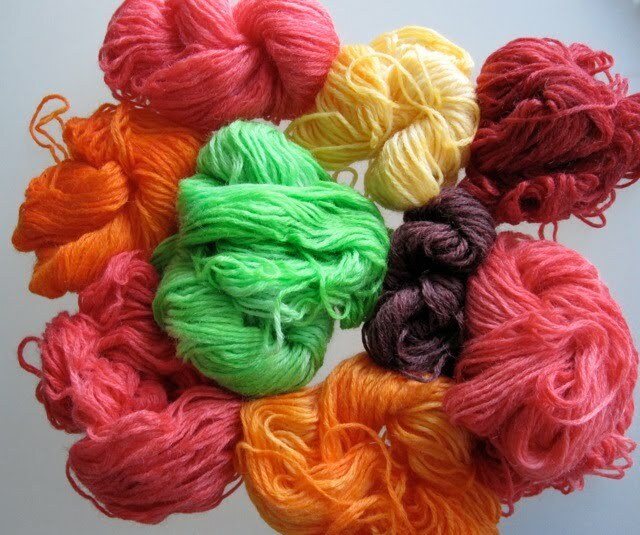 You said it's best to use wool, but I am wondering if I could do this to old cotton socks? To make baby legs? Fun stuff! 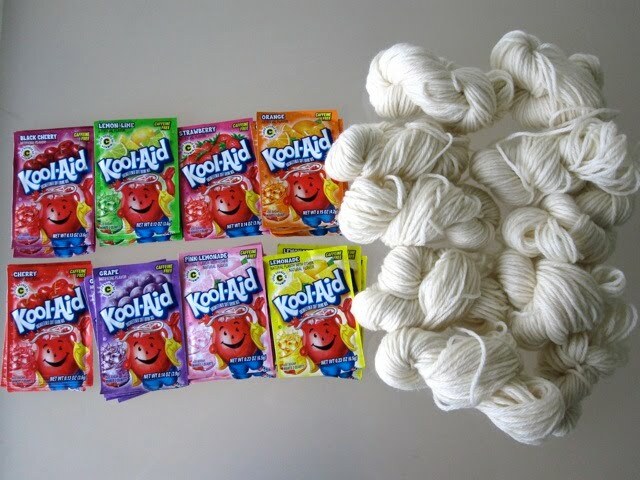 Every year after we dye eggs at my inlaws I get mad at myself for not bringing yarn to dye with the left over colors. 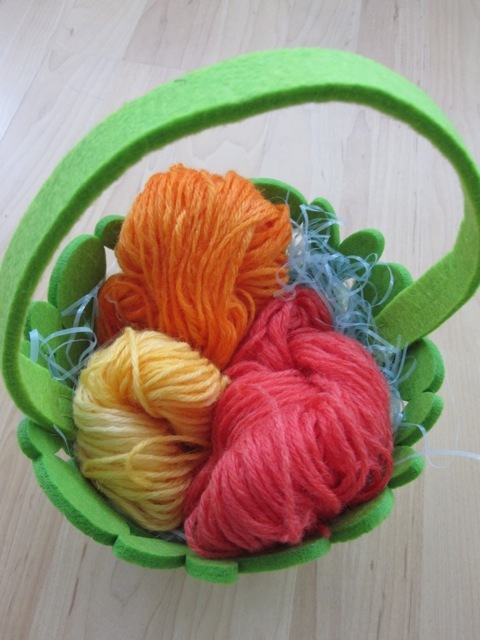 Have you dyed yarn with Easter egg dye? Can i use this method to dye a 100% wool vest? I love this!!! I'm gonna try it!! I' m always looking for ways to make a bigger mess! You have a great record of your experience. Makes me want to run right out and buy koolaid! I live in Alaska, so it would be a great winter project on the long dark days...Thanks for sharing this with us.